Over a year ago, the city of Kingston passed a resolution to welcome and include immigrants, also known as sanctuary. The ruling approved on Jan. 10, 2017 – barely one page long – addressed very important points, including that discrimination of any kind is forbidden and that the police department, the mayor and the police commission would develop policy and procedures to put in writing their current practices regarding when cases of undocumented people are referred to federal agencies and when they are not. As you probably remember, the February issue of La Voz included this news in an article about the sanctuary movement in the Hudson Valley. Kingston was the first of several cities in our area to make public its support for the entire community, including the most vulnerable immigrants. After Kingston, the cities of Newburgh, Beacon, New Paltz, Hudson and Poughkeepsie followed suit. All this was achieved thanks to the effort and unity of a number of people and organizations from these communities. But, back to Kingston, the point in the resolution that mentioned the establishment of police procedures in writing is still in process. That is, it does not exist yet. 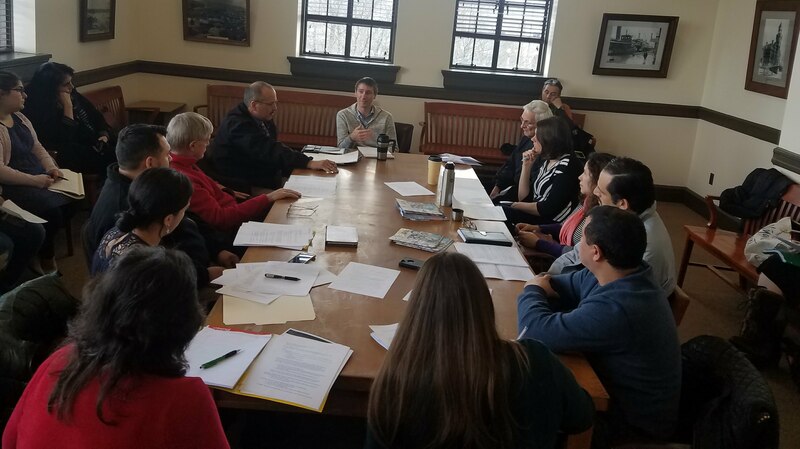 For that reason, a group of people convened by the Mano a Mano coalition in Ulster County met with Kingston Mayor Steve Noble and the city’s Police Chief Egidio Tinti on March 9. One thing that has been done is the allocation of $5,000 of this year’s budget to generate Spanish translations, the first time translation has received its own funding (not much, but it is a start) and will not rely solely on the assistance provided by volunteers. In the meeting, which I attended, we asked how the pledge made in the resolution over a year ago – which states that the police department must create internal policies to keep their promise to refrain from putting immigrants at risk – is being implemented. They are currently reviewing different policies, and we recommended the ones we think are best, based on research carried out by the New York Civil Liberties Union (NYCLU). We also asked for transparency and communication when the time comes to hold an officer responsible for failing to comply with the rules. Of the 72 police officers working in the city of Kingston, only one (Detective Reyes) speaks Spanish and only one is African American. That means that, in a city where 16 percent of the residents are Latino and 15 percent are African American, the police force is overwhelmingly white and monolingual in English. For that reason, we stressed the need to offer more anti-discrimination and cultural competence training. The police chief told us that some of the force’s members are taking self-guided Spanish lessons and that he would hire a new bilingual agent in the spring (doubling the police’s current capabilities, from one to two police officers able to communicate in Spanish). Attending the meeting were Oriana Mayorga (from Citizen Action and Mano a Mano), Rev. Erick Mercado (from Vida Real Church and Mano a Mano), Rev. Frank Alagna (from Santa Cruz Church and Ulster Immigrant Defense Network), Monique Tranchina (from RUPCO and Mano a Mano), María Elena Ferrer (from Mano a Mano and the Ulster County Human Rights Commission), Andrea Callan (from NYCLU), Emma Kreyche (from the Worker Justice Center – WJCNY – and Mano a Mano), Rev. Martin Thomas Deely (from Mano a Mano), Hugo Jule (from Mano a Mano), Mariel Fiori (from La Voz and Mano a Mano), Marco Ochoa (from Mano a Mano), Ignacio Acevedo (from Nobody Leaves Mid-Hudson), Alfredo Pacheco-Cruz (from Nobody Leaves Mid-Hudson), Antonio Flores-Lobos (from Mano a Mano), Christine Noble (from the Ulster County Office for the Aging and Mano a Mano) and Anique D’Angelo (from Planned Parenthood Mid-Hudson Valley and Mano a Mano). Mano a Mano is a coalition with a mission to serve the Spanish-speaking community of Ulster County by providing a structure in which agencies, individuals, businesses and organizations work collaboratively to network, support and foster a diverse community, promoting the language-appropriate and culturally-competent services provided by each member of the coalition. This mission is achieved by carrying out bimonthly meetings to share events, programs and information relevant to our community; identifying needs in our community that are not being met; finding appropriate resources to satisfy those needs; creating, maintaining and distributing a directory of services offered by the members of the coalition; coordinating events to present the services offered by the members to our community. The coalition’s next meeting will be held on Friday, May 18, at 1 p.m. To participate, or for more information, write to manoamanoulster@gmail.com. After the meeting, Hugo Jule commented: “I came out of my comfort zone and area of expertise to join and follow talented and passionate members of our very diverse community for a productive conversation with our elected officials. Positive change requires active participation.” There is strength in numbers, my friends.